Chez Elena is host to numerous special events throughout the year. Because it is a small hotel, the entire property can be transformed on occasion into a highly festive setting. Over the years we have hosted many wedding parties, often with members of the wedding party and friends flying to Vallarta to meet and celebrate. Other special events include everything from intimate anniversary and engagement dinners to corporate events, to small group getaways, and more listed below. For intimate parties a table can be arranged on the rooftop terrace in a charming nook created by a bevy of plants, and a candlelit dinner catered to perfection. French champagne, tropical flowers, a bit of music or an entire Mariachi band can be added to enhance the occasion. 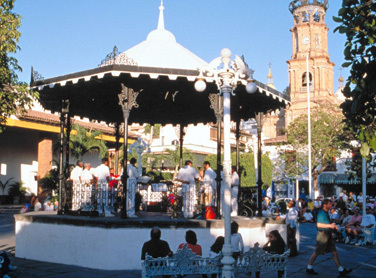 The charm of old Mexico in a garden setting allows visitors to enjoy another world and culture. We at Chez Elena take pride in catering to all of our guests needs, and every detail is attended to in a way which makes people feel when they leave that they have become part of Chez Elena and Los Cuatro Vientos extended family. What better place for a sunset wedding ceremony and/or starlit reception with dinner and dancing than Los Cuatro Vientos, with its picturesque rooftop terrace, El Nido, and its unequalled view of the entire Bay of Banderas, is the perfect setting for a romantic wedding in Mexico. Hosting and catering weddings has become a specialty over the years as delighted couples pass on word of mouth recommendations to their friends. And no wonder! Imagine exchanging vows as the sun eases into a dramatic backdrop of the blue Pacific and the lushly tropical Sierra Madre as church bells ring melodiously in the distance. Rest, relax and pamper yourself in this Pacific paradise hideaway, Hotel Los Cuatro Vientos. Start your day with yoga on our terrace overlooking the sea. Rejuvenate with our morning hike through town or jungle terrain. Participate in a fascinating two-hour class and roundtable discussion on subjects of special interest to women regarding different passages of life and their challenges. Savour the delights and variety of Mexican cuisine. Massage, facials, pedicures and manicures are given in-house. Visit the area's finest beaches. Enjoy in-house shopping with some of Vallarta's finest boutiques. You will meet and share experiences with your fellow participants as well as with women living in Mexico who offer a cross cultural view of adjustments to age and lifestyle which women everywhere encounter. A perfect time for mothers and daughters, sisters and just friends to share this special retreat that promises a memorable and delightful time together. The reasonably priced alternative to an expensive spa vacation you have been looking for! 2011 © Chez Elena and Los Cuatro Vientos. All rights reserved.